We will be re-printing the catalogue, but we are not expecting to have any available until mid to late June. In the meantime, you can download a digital copy of the catalogue here. If you would like a hard copy of the catalogue, please complete the form below and we will email you when the catalogue comes back into stock. If you are in the U.K. or E.U. and would like a free copy of our catalogue, please complete the form below and we will put you one in the post as soon as possible! * If you do not live in the U.K. or the E.U. and would like a hard copy of our catalogue, please click here. 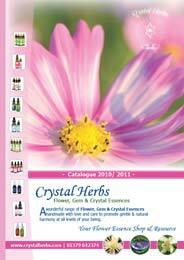 You can download a copy of our complete catalogue as a PDF here. Our catalogue contains a full listing of all of our essences and their uses, along with information about Bach Flower Remedies and deeper acting Flower, Gem & Crystal essences, together with a price list. ** Your information - We never share your information with any third parties.